If you failed to adequately insulate your pipes this winter season, you may be faced with frozen pipes. As soon as the water in your pipes begins to freeze and expand, your pipes are at risk of bursting, causing a lot of damage to your home. The term frozen pipes actually refers to the water that flows through your pipes. That is, it is the water in the pipes that freezes and causes them to burst, not the pipes themselves. 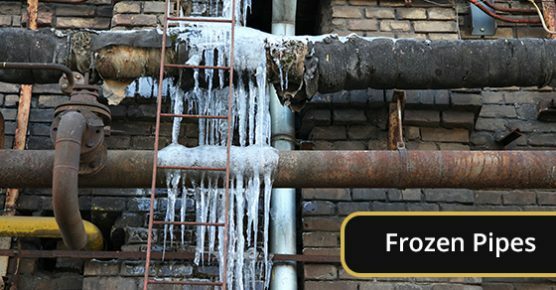 Your pipes can’t freeze if it’s not cold enough for water to freeze, however, as soon as it drops to 0 C, your pipes are at risk of freezing. First and foremost, did you protect your pipes this winter season by insulating them? Perhaps you forgot to check for air leaks near your pipes—remember, even the smallest opening can cause them to freeze. If you failed to take any measures to keep your pipes from freezing this winter season, chances are your pipes may already be frozen. Here are five tips to prepare your pipes for the cold weather. One sign that your pipes have frozen is that you can see visible frost on them. If you suspect that your pipes may be frozen, it is a good idea to check areas where the pipes are visible, such as under the sink, for frost. Another sign that your pipes may be frozen is if your faucets have slowed to a trickle. Perhaps your faucet doesn’t have any water flow at all. This is a sign that your pipes may be frozen. If this is the case, immediate action needs to be taken. The pressure created between the blockage and the faucet will soon cause the pipe to burst. If you suspect your pipes are frozen—especially if your faucets have slowed to a trickle—it’s important to contact an emergency plumber immediately. Do not wait. The longer you wait, the more likely it is that your pipe will burst. In the meantime, there are a few things you can do to reduce the likelihood of a burst pipe. If you are in need of emergency professional plumbing services, such as frozen pipe repair services, call Advanced Plumbing at 877-286-8044, or contact us online here. Advanced Plumbing uses high-tech tools and techniques to thaw frozen pipes, and we are available 24/7. Advanced Plumbing offers prompt plumbing services and honest pricing, and boasts 99.9% customer satisfaction.